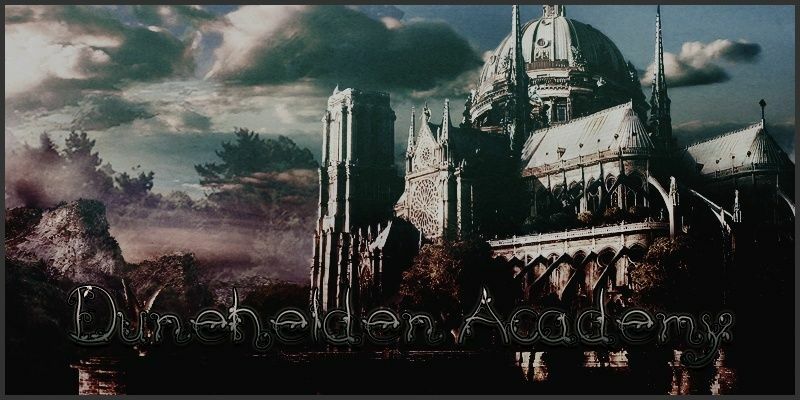 Dunehelden Academy is a school for the strange and unusual, the magical and the supernatural. For those who fit in nowhere else, Dunehelden is home. The field was barren-- encrusted with dead grass, dotted with delicate scarecrows held aloft by vines, their cornsilk hair fluttering in the dry breeze. The borders of the field seemed to stretch forever, a powerful glamour that created a dreamscape. This particular glamour dissolved once it was known, revealing a dozen acres of land sporting a single structure, a greenhouse veritably smothered in vibrant, flowering vines, nestled amongst the roots of a massive, wilted tree, also constricted by parasitic creepers. Bolin hunkered among those roots, listening to Vered Rosa humming to the blossoms she cultivated within the broken and beautiful structure. This particular Fae was a Collector, regarding living beings as trophies, baubles and property. Vered Rosa had a penchant for those possessing beauty in their youth, and proved particularly fond of noble daughters. Each girl was drained, slowly, their very life absorbed bit by bit as the Fae's tendrils constricted last dregs of human spirit from their bodies. Vered Rosa herself was an ethereal beauty, her visage kept vibrant and fresh over centuries on deception and ill-begotten youth. As a father himself, Bolin was all too happy to take this job. Baba, Zhenzhen purred, her voice echoing within the confines of his mind. The light is changing. Bolin's gaze shifted to the sliver of sky visible twixt the roots-- from a steely grey the light grew steadily more bloody, the thin shafts of sun that leaked into his hiding spot turning red, glinting gold with particles of pollen. Vered Rosa grew lethargic with the appearance of the moon, and as much as Bolin wanted her to suffer her end, this job needed to be done quickly. Days were long in this small realm-- nights were short and far between, and Bolin had witnessed at least one of the scarecrows still moving in the fields. If things went his way, only one more life would end in this field. And so Bolin waited. Until the light grew dim, and pinpoints of starlight could be seen overhead. He listened a moment longer, certain of the silence, and slithered from his hiding spot. On silent feet he padded into the greenhouse, towards an elaborate nest of silk and vines and rosebuds from which every tendril in the field seemed to trail. Bolin heard a chirruping noise and spun around just in time to catch the talon-like thorn that scythed towards his temple. With a wrenching motion he dragged the attached limb back, cinched it under his own arm to trap Vered Briar close to him. Her jewel-green eyes flashed as thin vines whirled and lashed around them, whipping at Bolin's face and arms, winding around his legs and waist and straining to constrict. Bolin squinted one eye shut against the blood that trailed from a fresh cut above his temple as Vered Briar opened her mouth wide to screech at him, huge thorns sprouting from her neck and shoulders as more vines gathered around her attacker. Perhaps the headhunter would get to make her suffer after all. A dangerous growl escaped Bolin. He jabbed his hands into Vered Briar's open maw, clenching both her upper and lower jaw, his fingers digging into her soft palette as his muscles tensed and he pulled. Vered Rosa's voice grew high-pitched and ragged, struggling desperately as Bolin slowly wrenched the top half of her skull from the rest of her body. There was a loud, wet cracking noise, and Vered Rosa went limp, vines and all. Bolin let the Fae's weight drop, grumbled as he brushed the rapidly drying vines from his own figure. What little of his skin was exposed was covered in tiny cuts and scrapes-- the photosynthetic Fae's magic was greatly weakened by the loss of the sun. For that, Bolin was grateful. Zhenzhen purred as Bolin slid Vered Rosa's head, sans lower jaw, into a special bag hanging from his belt. The rest of the Fae's body had become brittle and colorless. Bolin grimaced and brought his boot down on the withering tangle of creepers, and it crumbled into dust. There was a low, creaking moan from overhead, to each side, even from the soil below. The vines that blanketed the greenhouse were rotting, bowing under their own weight. Bolin scrambled from the building just in time, with the structure breaking into rubble on his heels. As he looked around, the scarecrows were tilting and snapping from their perches. Some had dissolved into dust. At the far end of the field, one scarecrow still stood. Bolin sprinted to the last of Vered Rosa's trophies. This girl had yet to take on the visage of bark and cornsilk-- either she had been collected very recently, or the Fae had been savoring this one. She couldn't have been past her late teens and, Bolin realized with a strong twinge in his chest, must be just a bit younger than his own daughter. He rummaged a serrated switchblade from one of his many pockets and began sawing at the vines that held her up. She sank as the vines ceased to hold her weight, and Bolin held her gingerly with one arm as he peeled the creepers from her with the other hand. Crystal had not realized she was dreaming. Rather, she had not realized she was dreaming until she felt the harsh feeling of reality pulling her back to consciousness. Her body felt by equal turns heavy and weak, and she realized slowly that she must have been laying outside somewhere, as she was covered in dry, brittle foliage. Was it autumn already? It had hardly been spring when she had fallen asleep, had it not? No, surely she was mistaken. As the world swam into slow focus, she realized that she was cold. She had not felt cold for so long that she had forgotten the feeling. The next thing that she became aware of was the warm, solid presence of another person near her. She wondered if she could trust him, but only briefly. As he peeled the dried leaves and vines away from her, she found herself clutching tight to his arms. "I, I don't..." Her voice was raspy and low from lack of use. She clearly her throat and consciously pitched her voice higher. "I don't know what happened." Bolin looked her in the eye and offered her the shadow of a smile. "You've been..." He searched for the right word as he pulled the last of the vines from her. "You've been part of a collection for a while. The Fae that was keeping you is-- well, she's gone now. You're the only one left." He helped her to sit upright and brushed a dried leaf from her hair. "I can't say my name out loud on this side of the Border, but I swear to you that I'm a trustworthy person. And I come from a safe place-- you're welcome to come back with me." "Can you remember anything? Where you're from?" He paused. "Or when?" » Rosa A, Red "The Airhead"